Now some not so fortunate folks who reside in even hotter conditions must be rolling their eye-balls at that temperature reading, let me tell you folks, I empathize with you. Let me share a recipe that can help you keep cool in these harsh conditions. Solkadhi is a popular drink in the entire Goa-Konkan coastal belt. It can be consumed completely on its own or can be served with the main course. It serves as a coolant and aids in digestion and is typically consumed after the spicy fish curry. Kokum is an important ingredient of this drink along with coconut milk. A yard of a typical Goan-Konkani home is decorated with lines of coconut and Kokum trees. Kokum also known as Ratamba or Amsul is native to Western Ghats of India and hence less known in other parts of country. Kokum trees bear fruit through the month of March, April and May. For remaining part of years derivatives of Kokum fruit like dried kokum skins, powder and kokum syrups are available. While the kokum fruits tastes sweet and acidic, the dried rinds are very sour and metallic in taste. These dried rinds are used as an ingredient in recipe of Solkadhi. 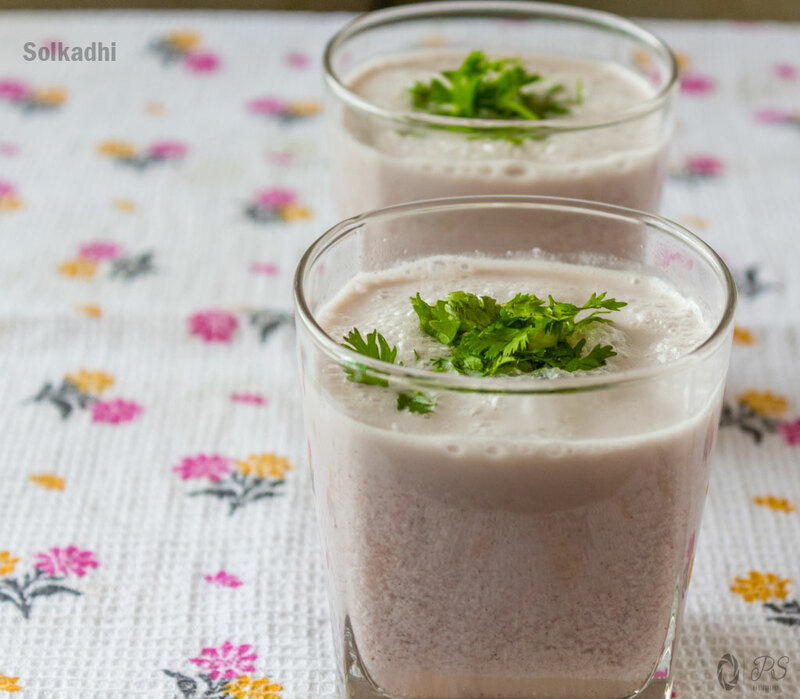 Solkadhi is an interesting drink that combines the sweetness of coconut milk with sourness of kokum. For added taste and flavor chilies are added to impart spiciness. 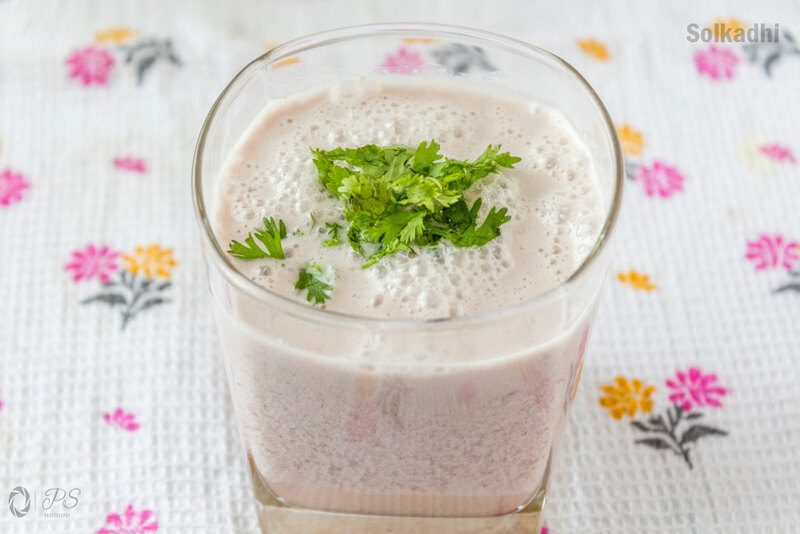 This makes Solkadhi a complete meal in itself that fulfils almost every taste that is prescribed by Ayurveda and which must be included in our every meal – sweet, sour, spicy, astringent, bitter and salty. 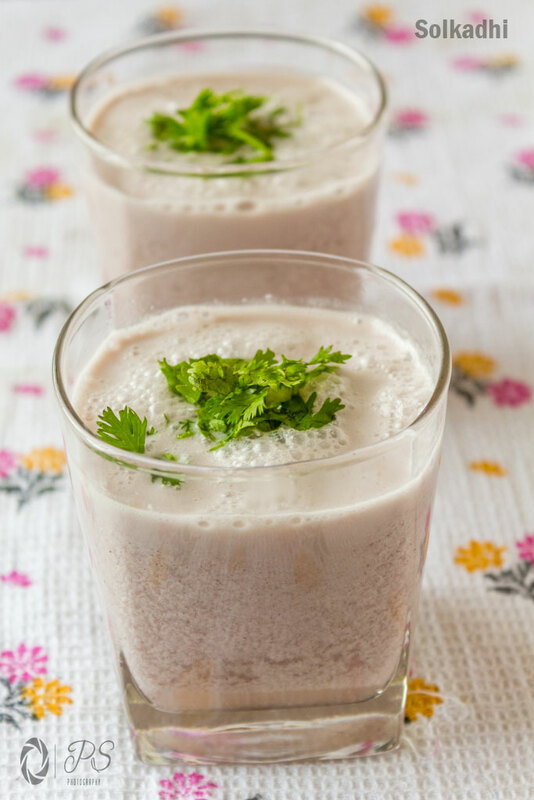 Let’s go through the detailed recipe of Solkadhi. In a blender jar put grated coconut. Add garlic, cumin seeds, black peppercorns, green chilies. Grind into a fine paste with 1 cup of water. Squeeze the Kokum rinds with your fingers and run the kokum extract through a sieve. Add salt to coconut milk. Add kokum extract and stir. Solkadhi is an essential part of Goan-Konkani meal. It aids in digestion. i am ordering indian ingredients online and i saw dry kokum, wet kokum and phool white kokum. can you tell me the differences? and their uses? Hi thanks for stopping by! You may order dry or wet kokum for your culinary uses !